1. Section of Nuclear Medicine and PET, Department of Surgical Sciences, Uppsala University, Uppsala, Sweden. 2. Affibody AB, Solna, Sweden. 3. Department of Immunology, Genetics and Pathology, Uppsala University, Uppsala, Sweden. 4. Preclinical PET Platform, Uppsala University, Uppsala, Sweden. Purpose: Positron Emission Tomography (PET) imaging of HER2 expression could potentially be used to select patients for HER2-targed therapy, predict response based on uptake and be used for monitoring. In this phase I/II study the HER2-binding Affibody molecule ABY-025 was labeled with 68Ga-gallium ([68Ga]ABY-025) for PET to study effect of peptide mass, test-retest variability and correlation of quantified uptake in tumors to histopathology. Experimental design: Sixteen women with known metastatic breast cancer and on-going treatment were included and underwent FDG PET/CT to identify viable metastases. After iv injection of 212±46 MBq [68Ga]ABY-025 whole-body PET was performed at 1, 2 and 4 h. In the first 10 patients (6 with HER2-positive and 4 with HER2-negative primary tumors), [68Ga]ABY-025 PET/CT with two different doses of injected peptide was performed one week apart. In the last six patients (5 HER2-positive and 1 HER2-negative primary tumors), repeated [68Ga]ABY-025 PET were performed one week apart as a test-retest of uptake in individual lesions. Biopsies from 16 metastases in 12 patients were collected for verification of HER2 expression by immunohistochemistry and in-situ hybridization. Results: Imaging 4h after injection with high peptide content discriminated HER2-positive metastases best (p<0.01). PET SUV correlated with biopsy HER2-scores (r=0.91, p<0.001). Uptake was five times higher in HER2-positive than in HER2-negative lesions with no overlap (p=0.005). The test-retest intra-class correlation was r=0.996. [68Ga]ABY-025 PET correctly identified conversion and mixed expression of HER2 and targeted treatment was changed in 3 of the 16 patients. Conclusion: [68Ga]ABY-025 PET accurately quantifies whole-body HER2-receptor status in metastatic breast cancer. Breast cancer is the most common cancer in women with a 12% lifetime risk. The 2012 incidence in the EU was 367000 cases and 91000 deaths were recorded . On the molecular level, growth of breast cancer is highly heterogeneous and therapeutic decisions require characterization of several receptors using immunohistochemistry (IHC) . Human epidermal growth factor 2 (HER2) belongs to the ErbB family of transmembrane tyrosine kinase receptors and has no known natural ligand . HER2 is overexpressed in 15-20% of cases [4-6] at initial diagnosis and is associated with poor survival [4, 6]. HER2-targeted treatments have improved survival of patients with HER2-positive breast cancer significantly [4, 6, 7]. Clonal differentiation resulting in discordance in HER2 expression between primary tumor and metastases has been observed in up to 40% of cases [5, 8, 9] and current guidelines advocate biopsy and renewed IHC from at least one metastasis prior to decisions on further HER2-targeted therapies . Similarly, metastatic HER2 expression can change over time, which could necessitate a change of therapy [11, 12]. However, metastasis biopsies are not always obtained for practical reasons or patient discomfort and guideline implementation may vary greatly. Positron Emission Tomography (PET) imaging might permit a quantitative whole-body approach to HER2 expression evaluation. Several attempts of creating radiopharmaceuticals for HER2-imaging with PET and SPECT are on-going . PET and Single Photon Emission Tomography (SPECT) using radiolabeled trastuzumab visualizes HER2-positive breast cancer metastases in patients, but imaging has to be done several days after injection due to slow blood clearance of antibodies . F(ab')2 fragments of trastuzumab labelled with the short-lived isotope 68Ga were safe and provided imaging during the day of injection but lesion detection rate was suboptimal . Another approach uses Affibody molecules, which are 6.5 kDa peptides derived from a non-immunoglobulin scaffold. ABY-025 is a HER2-binding Affibody molecule that specifically binds to a site on the receptor not occupied by current targeting therapeutic drugs [16-18]. In a recent study with breast cancer patients, [111In]ABY-025 SPECT/CT appeared promising for further clinical use , but some issues were noted. Quantification required dual time point imaging. Smaller metastases seen on FDG-PET/CT in the HER2-positive patients were not detectable with [111In]ABY-025, most likely due to the lower resolution of SPECT. The [111In]ABY-025 study explored a single preparation of tracer with a relatively low amount of injected peptide, which, if increased, might also have an impact by reducing binding in normal tissues and lesions with low HER2-expression, as shown in experimental models  and patient studies with other peptides . Labeling of a ABY-025 analogue with [68Ga]-gallium for PET demonstrated high tumor-to-background images early after injection in the preclinical setting , suggesting that a same-day protocol could be feasible in humans. Due to superior quantitative properties, PET might also allow the use of metastatic Standard Uptake Values (SUV) from a single whole-body image to be used as a marker of HER2-grading. Still, SUV measurements are associated with several potential error sources and validation of the use of quantitative image properties requires test-retest protocols to assess the combined effect of biological and technical variability. The current study thus evaluated [68Ga]ABY-025 PET/CT with regard to safety, impact of administered peptide mass, feasibility of measuring metastatic HER2 expression in breast cancer and test-retest variability. The trial was carried out in two stages. The first stage focused on maximizing image contrast by combining evaluation of images obtained with different injected peptide mass as well as images acquired at different scan times after injection. The second stage was conducted to calculate a reproducibility coefficient of metastatic SUV measurements by performing test-retest measurements with the peptide dose and scan time as defined in the first phase. A total of 16 women with known metastatic breast cancer were included. Patients diagnosed with metastatic breast cancer and known HER2 classification of primary tumor were potential participants (HER2-positive: HercepTest score 3+ or HercepTest score 2+ and FISH-positive; HER2-negative: HercepTest score 0 or 1+, or score 2+ but FISH-negative). On-going treatment was not an exclusion criterion. Ten patients were enrolled for the first phase, six of these were included as HER2-positive and four as HER2-negative controls. Six patients with known HER2-positive tumors were enrolled for the second phase. Patient characteristics are summarized in Table 1. Biopsies based on PET findings were guided by ultrasound or CT. The study was an academically sponsored clinical trial (trial identifiers EudraCT 2012-005228-14 and NCT01858116), approved by the regional ethics committee and the Swedish Medical Products Agency. All patients signed informed consent. GMP grade ABY-025 was provided by Affibody AB in vials containing 100 µg. 68Ga was obtained from a 68Ge/68Ga-generator (IGG100, Eckert & Ziegler). The eluate fractionation method was used for the production . Time (5-20 min), temperature (60-95 °C), radical scavenger (ethanol, ascorbic acid), buffer (acetate, HEPES), pH (3.6-5.0), product purification step (solid phase extraction cartridges), product formulation (phosphate buffer, saline), and sterile filtration (sterile filter discs) were optimized for two dose preparations with low (LD, 78±8 µg) and high (HD, 427±19 µg) peptide content. GMP-compliant, reliable and highly reproducible production with control over the product peptide concentration and radioactivity was accomplished within one hour. The radioactivity delivered for the LD and HD could be kept similar and independent of the generator age throughout whole study due to the use of similar radioactivity amount for the labeling after buffering the generator eluate. The specific radioactivity was 6-fold higher for the LD preparation. Final product purification excluded contamination with 68Ge and provided radiochemical purity (RCP) of over 95%. Quality control was conducted using UV-Radio-HPLC. PET/CT imaging from skull to mid-thigh was performed at three occasions, within 14 days in all patients, once with [18F]FDG and twice with [68Ga]ABY-025. First, FDG-PET/CT was performed to locate viable metastases using a standard clinical protocol. In the first ten patients PET/CT with LD peptide content was performed one to seven days after FDG-PET/CT. [68Ga]ABY-025 (212±46 MBq) was injected, and imaging was done at 1h, 2h and 4h after injection. One week after the LD PET, PET/CT with HD peptide mass was performed, with the same radioactivity dose and scan protocol as for the LD study. In the last six patients, HD [68Ga]ABY-025 PET/CT was performed twice at 2h after injection one week apart for test-retest purposes. Planned medication was given as prescribed throughout the study. LD PET always preceded HD PET to minimize the potential effects of prolonged binding to target on the subsequent scan. Tumor samples were preserved in 10 % neutral buffered formalin for between 12 and 48h, for routine processing and paraffin embedding according to standard laboratory procedures. Skeletal biopsies were analyzed with a limited acid decalcification in formic acid (Agartz solution by Solveco) to preserve DNA sufficient for in situ hybridization, and carefully interpreted regarding IHC and ISH on decalcified material. HER2 IHC was performed with a HercepTest on a DAKO autostainer, according to the manufacturer´s instructions. Each slide included a positive control, and in each staining run a control slide with three pelleted, formalin-fixed, paraffin-embedded human breast cancer cell lines with intensity scores of 0, 1+ and 3+ were included. Also, non-specific staining was evaluated using a non-specific negative control reagent. In the final slides the membrane staining intensities and patterns were evaluated as 0, 1+, 2+ or 3+ according to guidelines . Thus, a HER2-staining interpreted as IHC 3+ was considered HER2-positive, and stainings interpreted as 0 or 1+ were considered HER2-negative. A result of HER2 IHC 2+ or 3+ was further investigated with a reflex test using in situ hybridization methods. For HER2 fluorescent in situ hybridization assay (FISH), slides were hybridized with probes to locus-specific identifier HER2/neu and to centromer 17 by use of the PathVysion HER2 DNA Probe kit (Abbott Molecular, Abbott Park, IL). For HER2 dual in situ hybridization (SISH) a Roche Ventana INFORM HER2 dual ISH DNA Probe Cocktail Assay was used. Batch-controls were used to show appropriate hybridization, and normal fibroblasts served as internal controls. The amplification ratios, as well as the average HER2 copy numbers, were calculated and interpreted according to guidelines . FDG-PET/CT data, supported by previous imaging using other modalities if needed, were analyzed for metastatic lesions according to routine clinical criteria by experienced observers. 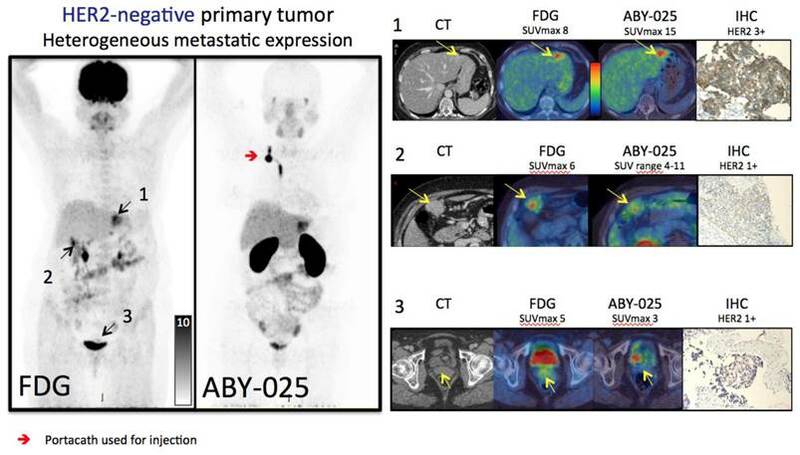 Guided by findings from FDG-PET/CT, subsequent [68Ga]ABY-025 whole-body images were analyzed for uptake in metastases and the maximum SUV (SUVmax) of metastases was recorded (SUV=1 equals radioactivity concentration at homogenous whole-body distribution). Values are reported as mean ± standard deviation (SD). Uptake changes over time were assessed using Kruskal-Wallis ANOVA. Comparisons were assessed using Wilcoxon rank tests. Correlation of metastatic SUVmax and HER2-scores was calculated using Spearman's rank. A P-value less than 0.05 was considered statistically significant. Fifteen patients performed all scans according to protocol. Patient 12 was recruited to part two of the trial but did not perform a retest scan, because FDG-PET and the initial ABY-025 scan did not show any remaining viable metastases. No adverse events with possible or probable relationships to the study drug were reported. However, seven non-serious adverse events with “unlikely” relationships were noted. Two patients had two episodes of mild dizziness right after the ABY - PET investigation. Both patients recovered in a few hours. One case of mild itching at the study drug administration day was reported. Another patient reported increased diuresis grade 1 few days after study drug administration. Same patient had elevated ASAT and ALAT grade 4 during one week after the first study drug administration. The relationship to study drug was however unlikely as the values were increased before start of therapy. In addition, six serious adverse events were observed and assessed as not related to the study drug; two cases of dizziness probably due to brain metastasis, one case of fever without infection, one case of hospitalization due to disease progression and two events of local infection in one patient. A total of 16 biopsies taken from 12 patients were confirmed to be metastases of breast cancer and analyzed for HER2 status. The biopsy findings are summarized in Table 2. Biopsies in remaining patients were declined either by the patient or referring physician. FDG-PET/CT detected at least two lesions per patient. For lesions with verified HER2 status from IHC, average SUVmax for FDG was 11.4 ± 7.2 in HER2-positive lesions and 6.5 ± 4.2 in HER2-negative (P=0.11, not significant). List of verified lesions with SUV from FDG and from [68Ga]ABY-025 PET/CT with two different doses of unlabeled peptide (LD and HD) at 1, 2 and 4h after tracer injection. Patients 11-16 were only scanned at 2h after tracer injection. No biopsies were available from patients 5, 7, 11 and 15. IHC: immunohistochemistry using HercepTest. ISH: In Situ Hybridization. nd: not done. LD: low peptide dose. HD: high peptide dose. *: complete separation between groups. The highest accumulation in normal tissues was seen in renal cortex. Excretion to urine was minimal and lower than bladder wall in all cases. Normal liver uptake was higher with the low peptide dose (p<0.01). One hour after injection approximately 15% of the injected radioactivity with LD was present in the liver, compared to 9% for HD. The liver washout rate was similar at later time points, and LD liver SUVs therefore remained higher than HD. In two patients, liver metastases were clearly visualized with HD PET but not with LD PET (see Figure 1 for example). Activity in blood pool was higher with the HD injection at 1h. At 2-4h after injection, activity in the blood pool had decreased substantially for both LD and HD and did no longer affect discrimination of metastases. Background SUVs in tissues other than liver were relatively similar over time in most other normal tissues. Of relevance to the diagnosis of breast cancer metastases, uptake in normal bone marrow and normal brain was minimal in all patients. Salivary glands, gastric wall and intestines showed moderate persistent uptake of SUV 3-5 (Figure 2). Moderate uptake without suspicion of cancer was seen in thyroid and ovaries in single patients. One patient, included as HER2-negative, had myocardial uptake of SUV 8, while all other patients had no discernable myocardial uptake. Uptake images of [68Ga]ABY-025 with low (LD) and high administered peptide dose (HD) at 1, 2 and 4 hours after injection in patient 2. All images are normalized to the same scale of SUV 10. A rainbow color scale is used, red color: SUV>10. Normal soft tissue uptake was higher with LD. Note the gradually higher contrast of metastases in liver and bone (arrows), due to both disappearance of normal liver uptake and tumor uptake accumulation. Maximum Intensity Projection PET images from two studied patients with wide-spread metastatic breast cancer. A: Patient 5 HER2-negative. B: Patient 7 HER2-positive. FDG-PET images (A1, B1) and [68Ga]ABY-025 PET images (A2=HER2-negative, B2=HER2-positive) are shown. All images are normalized to SUV 10. Darker colors indicate higher uptake. Five patients completed all scans in the test-retest phase. Seventeen larger lesions consistent with metastases of breast cancer were identified by FDG-PET/CT. All five patients had at least two lesions and SUVmax values from both [68Ga]ABY-025 PET analyses were obtained in the two largest lesions in each patient (see supplementary material Table S1 for details). SUVmax for the 10 metastases from the first and second scan averaged 11.0 ± 11.0 and 10.5 ± 10.3, respectively (P = 0.11, not significant). Using a value of 1.96* SD of differences, the repeatability coefficient was 1.5 SUV in absolute terms and 18% in relative terms. The intra-class correlation was r=0.996 (P<0.001). SUV of lesions classified by histopathology as HER2-positive and HER2-negative was significantly different at all time points and for both peptide doses (details in Table 2). SUVmax increased in HER2-positive over time with both doses but remained unchanged for HER2-negative. Tumor SUV values in HER2-positive metastases at 1h were higher for HD (p < 0.05) than for LD. Mean SUVmax for HD PET at 4h was 15.0±3.4 in HER2-positive (n=6) vs 2.7±2.1 in HER2-negative (n=6) (p<0.005), a factor 5.5 higher. There was a significant correlation of HER2-scoring (from 0 to 3+) and [68Ga]ABY-025 SUV with a small overlap at 2h of HER2-positive and -negative lesions (n=16, r=0.85, p<0.001) and no overlap at 4 hours (n=12, r=0.91, p<0.001, see Figure 3). Thresholds identified as suitable for discriminating HER2-pos from HER2-neg were SUV 6 at 2h and SUV 8 at 4h. The highest SUVmax of any metastasis in the study was 64 and was noted at 4h in a liver metastasis in patient 7. This patient had a large burden of metastases with intensive uptake, but no biopsies were performed due to terminal disease. Relation of PET Standard Uptake Values (SUVmax) of [68Ga]ABY-025 and corresponding HER2-scoring from combined immunohistochemistry and in situ hybridization in 16 biopsied metastases. PET images were obtained at 2 (all 16 patients) and 4 hours (10 patients) after injection of 212±46 MBq [68Ga]ABY-025 with peptide mass 427±19 μg (HD). A: correlation of SUVmax and HER2-score in 16 biopsied metastases at 2h imaging. A threshold of SUVmax=6 separated HER-negative from HER2-positive with an accuracy of 88%. Hollow squares indicate metastases from patients only scanned at 2h. B: correlation of SUVmax and HER2-score in 12 biopsied metastases at 4h imaging. At this time point separation of HER-negative from HER2-positive increased and a threshold of SUVmax=8 had an accuracy of 100%. C: The plot shows the range of [68Ga]ABY-025 SUVmax in all nodular metastases (black dots) identified using FDG-PET/CT in all 16 patients undergoing [68Ga]ABY-025 PET/CT at 2h after injection of tracer with high peptide content. Crosses symbolize biopsied metastases. The red line indicates a proposed threshold at SUVmax=6 for discriminating HER2-positive and HER2-negative metastases. Notheworthy, based on PET the majority of patients had heterogeneous HER2 expression with both HER2-positive and HER2-negative metastases. Based on the results from [68Ga]ABY-025 PET/CT, mixed expression of HER2 in metastatic breast cancer was seen in several patients and confirmed by biopsies in 2. Patient 9 had HER2-negative primary tumor and was enrolled as negative control. FDG-PET/CT showed metastases in left liver lobe, peritoneal lymph nodes and cervix of uterus. ABY-025 uptake was high in the liver metastasis, low in peritoneal metastases and absent in the cervical region (not shown). According to IHC, the liver finding was true positive and both other sites were true negative. Several HER2-positive patients exhibited a heterogeneous inter-metastatic receptor expression with a wide range of ABY-025 SUVmax in metastases (see Figure 3C). The range of variation differed, but notably some patients had variability across the SUV threshold identified as suitable for discriminating HER2-positive from HER2-negative. Thus, these patients have a concomitant HER2-positive and HER2-negative disease. In two cases this was verified by biopsies (see Figure 4 for example). HER2-targeted treatment was changed as a consequence of [68Ga]ABY-025 PET in 3/16 patients. Patients 2 and 4 were both included in the HER2-negative cohort and both had primary tumors defined as HER2+/FISH negative. PET indicated very high metastatic HER2-expression in both, which was confirmed by biopsies targeted at PET-findings, and both started trastuzumab treatment. Patient 8 had a HER2-positive primary tumor and received trastuzumab treatment due to known bone metastases at inclusion in this study. [68Ga]ABY-025 PET/CT suggested conversion to HER2-negative status with minimal uptake in all bone metastases, which was confirmed by biopsies in two locations and trastuzumab treatment was stopped. This study investigated the feasibility of [68Ga]ABY-025 PET/CT for visualizing and measuring the HER2 expression in metastatic breast cancer. Overall, the findings point toward the potential of using this tracer as an alternative to repeated biopsies and IHC+ISH in this patient group with a scanning protocol suitable for clinical routine use. The correlation of [68Ga]ABY-025 uptake towards results of centralized IHC+ISH was encouraging. Scanning at 2-4h with the higher injected peptide dose provided the best quantitative and visual discrimination. SUV values in lesions with confirmed HER2-status were significantly associated with HER2-scores and were approximately five times higher in the HER2-positive metastases, compared to HER2-negative, which was anticipated from the literature [2, 24]. Although the number of subjects was limited, metastases from most organs with a metastatic preference were included. Liver and bone metastases predominated, but also metastases in lymph nodes, brain and other organs were seen. HER2-positive liver metastases presented with higher uptake than metastases in any other organ. The background uptake in both bone marrow and brain was minimal at both 2h and 4h after injection and even uptake in smaller metastases and metastases with low expression were therefore easily identified. No brain metastases were biopsied and hence no firm conclusions regarding the relation of SUV towards true expression can be made. Four known brain metastases had SUVs ranging from 0 to 18 (example in Figure S2A in Supplementary material). In bone, multiple lesions were biopsied associated with a wide range of SUVs. A five times higher injected peptide dose provided higher contrast images due to significantly higher uptake in metastases of all locations. Uptake in normal hepatic tissue was lower at HD, which additionally contributed to higher contrast for liver metastases. Although expression of HER2 in hepatocytes is low, liver receives ca. 25% of total cardiac output and the hepatic vasculature is well-fenestrated. This creates preconditions for efficient sequestering of radiolabeled Affibody molecules from blood. Increasing injected peptide dose would saturate the known sparsely expressed HER2 in liver  and pass more Affibody molecules, including radiolabeled ones through the “liver barrier”, thus making [68Ga]ABY-025 more available for targeting extrahepatic lesions. A similar effect was observed in a clinical study on HER2-imaging using 89Zr-labeled antibody trastuzumab ; injection of 10 mg of trastuzumab resulted mainly in hepatic uptake of the antibody, while injection of 50 mg enabled visualization of metastases. Preclinical studies on anti-HER2 Affibody molecules  have demonstrated that it is possible to saturate low-expression sites by increasing injected peptide dose without saturation of xenografts with high HER2 expression. The majority of all HER2-positive lesions were seen already at 1h after injection, but uptake increased significantly over time from 1h to 4h. HER2-negative lesions showed persistent minimal uptake from 1h to 4h. This is in line with findings from the [111In]ABY-025 SPECT/CT study, where HER2-positive lesions increased uptake by 25% from 4h to 24h, while no increase was seen in any HER2-negative lesion . Considering both studies, ABY-025 has minimal retention in metastases with low HER2 expression, while high HER2 expression in metastases is associated with continued accumulation from 1h to at least 24h after injection. The overall biodistribution of [68Ga]ABY-025 was roughly equivalent to the [111In]-labeled counterpart, although liver uptake using SPECT tended to be even higher than LD PET relative other organs. This might be an aspect of both scanner and tracer differences, but is most likely also related to the mandatory 6h fasting introduced in the current study protocol. Fasting was introduced after an observation in the former SPECT study, where there was an outlying low liver uptake in one patient out of seven, coinciding with a long fast before tracer injection in that particular patient. In comparison, SPECT scanning was also associated with less good visualization of smaller HER2-negative metastases, which is likely an effect of scanner performance. The results from this study with [68Ga]ABY-025 show that a same day procedure is feasible for HER2 assessment using PET, with labeling in the morning, imaging 2-4h after tracer injection, followed directly by image interpretation. Studies in a larger cohort are needed to corroborate the optimal scanning parameters. Studies with a multi-center approach are also needed to identify the best approach for image analysis and quantification. In this study a SUVmax, the voxel with the highest uptake in a metastasis, was used. 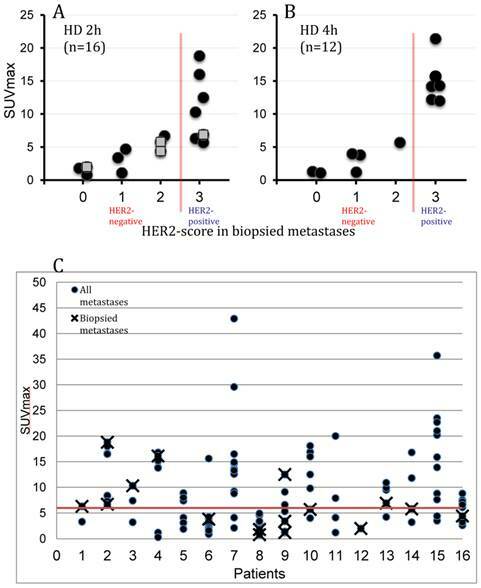 SUVmean, the average uptake in the entire tumor, might conceal a clinically important intra-metastatic heterogeneity of receptor expression, as seen in Figure 4. The test-retest calculations showed that the repeatability coefficient was 18% in relative terms and 1.5 SUV in absolute terms, equivalent to FDG SUV . A change of SUV in a metastasis exceeding these measures at a follow-up scan would hence indicate a true change in ligand binding. This information is required to perform power analyses for the required future validating studies, but also points to a use of repeated [68Ga]ABY-025 PET/CT measurements in treatment follow-up of individual patients and as a starting point for using ABY-025 PET as a pharmacodynamic marker in evaluation of new anti-HER2 drugs. Repeated biopsies are rarely performed in the same metastasis and little is therefore known about changes in receptor expression during treatment. As treatment resistance eventually develops in the large majority of cases with breast cancer metastasis, serial PET might be relevant for early indication of poor response to targeted therapies. Although this study enrolled a small number of patients, there were clear examples of four clinically relevant HER2 expression patterns: 1) conversion from HER2-positive to HER2-negative status; 2) vice versa; 3) very high HER2 levels; and 4) concomitant HER2-positive and HER2-negative disease (mixed). 1) One patient was included as HER2-positive, but had minimal uptake in spite of a large burden of bone metastasis (see Figure S2B supplementary material). 2) Conversion from a HER2-negative primary tumor to HER2-positive metastases was detected in two patients. Both were included as HER2-negative, but both were borderline positive (primary tumor IHC 2+ and ISH negative). 3) Using a novel IHC ligand assay, Bates et al  described a subpopulation of patients with very high HER2 expression levels and no response to trastuzumab. Current IHC guidelines do not subdivide the HER2-positive group quantitatively and therefore cannot identify a very high expression. Patient 7 had progression of metastasis from a HER2-positive primary tumor at inclusion in this study. Trastuzumab was given since first detection of spread disease, but no treatment response was achieved. Metastatic HER2-status was not recorded, as no biopsies had been carried out. [68Ga]ABY-025 uptake in all metastases was intense with a highest SUV of 64 at 4h in a large liver metastasis. Thus, the quantitative aspect of [68Ga]ABY-025 might be used clinically to determine this potential novel biomarker of de novo resistance. 4) Applying a strict threshold of SUV 6 for discrimination of HER-positive from HER2-negative at a 2h scan, the majority of patients had an inter-metastatic range of HER2 expression crossing this boundary. Thus, they would be defined as having mixed disease. In such cases, clinical options may include treatment for HER2-negative metastases. A mixed HER2 expression pattern was confirmed with IHC+ISH in two patients in this series. Affibody molecules are a novel class of peptide, previously only injected in a total of 10 patients prior to this study [19, 28]. Here, a further 32 doses were given in 16 patients. There were only few adverse events recorded and none could be attributed to the study drug. A major alternative approach to development of HER2 imaging agents is based on the radiolabeled therapeutic monoclonal antibodies [14, 29]. However, the contrast provided by antibodies is limited because of slow blood clearance of intact immunoglobulins. Comparison of preclinical data  suggests that Affibody molecules provide much higher contrast than antibodies. For example, tumor-to-blood ratio is at least by one order of magnitude higher for Affibody molecules. The higher contrast should improve sensitivity of diagnostics using Affibody molecules. Another issue is the unspecific uptake of large (>45 kDa) immunoglobulins in tumors due to enhanced permeability and retention (EPR) effect , which creates a risk of false-positive findings. Due to size-dependence, the EPR effect should take place not only for intact antibodies but also for smaller fragments and constructs, such as (Fab')2, Fab, minibodies and diabodies. Complementary imaging with a non-HER2-specific antibody has been suggested for correction for non-specific uptake in the tumours . However, this complicates the imaging procedure appreciably. The EPR effect is possibly a reason that no clinical data have demonstrated a correlation between antibody uptake and HER2 expression in tumors yet. On the opposite, preclinical data showed no EPR effect for Affibody molecules . The current study confirms that direct and non-invasive quantification of HER2 expression using Affibody molecules is possible in clinics. [68Ga]ABY-025 PET/CT accurately measured expression of HER2 in breast cancer metastases. Short-term variability of uptake was small and [68Ga]ABY-025 PET/CT could therefore be useful for repeated non-invasive mapping of HER2 expression in metastatic breast cancer. The authors wish to thank the staff at Uppsala PET Centre and Department of Nuclear medicine, as well as research nurse Åsa Johansson, for excellent help in conducting the trial. This work was sponsored by The Swedish Cancer Society (Cancerfonden) and The Swedish Breast Cancer Foundation (Bröstcancerfonden). Affibody AB donated ABY-025. Anders Wennborg and Joachim Feldwisch are employees of Affibody AB.